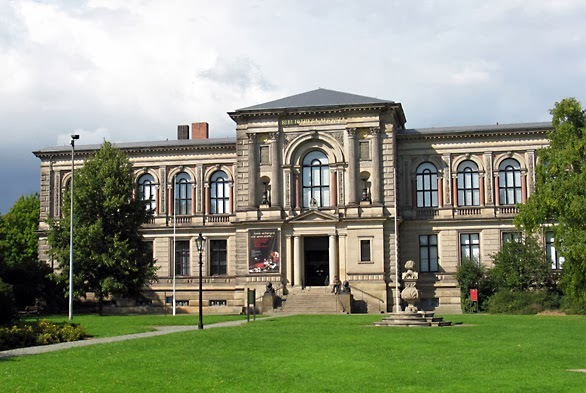 Founded in 1572 by Duke Julius of Brunswick-Wolfenbüttel, the Herzog August Bibliothek became soon one of the largest European libraries with the passionate book hunter and collector Duke August (1579-1666) and boasts among its librarians famous thinkers like Gottfried Wilhelm Leibniz and Gotthold Ephraim Lessing. Today it houses more than one million imprints - most of them dated before 1850 - and represents one of the oldest and most significant libraries of its days which has survived to the present without substantial losses to its original collection. Therefore one cannot be surprised about the fact that the HAB is today an international research centre for early modern studies. Pleasantly unexpected may appear instead the interest even in current matters and the existence of other special collections such as that of artists’ book. The Malerbücher Sammlung collect more than 4.000 items, including works combining text and illustrations by famous painters and sculptors, such as Braque, Chagalle, Dalí, Enst, Matisse, Léger or Wols. These volumes are stored in the historical building of the Augusta, the hearth of the HAB, where in a special room temporary exhibitions take place. The present one is entitled Kriegsdeutungen im Künstlerbuch ("Interpretation of the war in the artists' book") and is open till 18th May 2014. The exhibition aims to inspect the representations and interpretations of war experiences in the artistic illustration collected in printed books or series, starting with the Great War up to the present. Works by contemporary artists such as Barbara Fahrner and Mimi Gross are displayed together with testimonies of the WWII by Frans Masereel or Roland Dörfler. The focus is however on the WWI and interesting works by Richard Seewald, Erich Erler and Max Beckmann are displayed. Above all Otto Dix’s Der Krieg (The war) is of great impact. 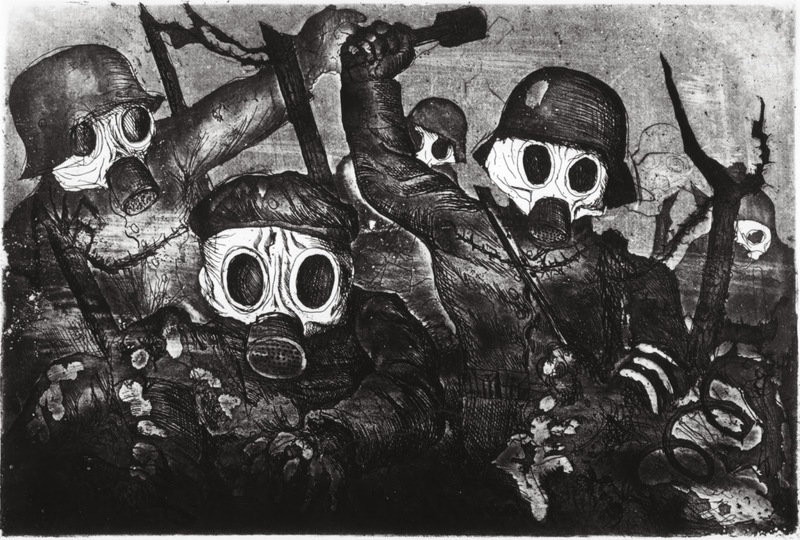 Largely based on his memories as machine gunner from 1914 to 1918 on both Eastern and Western fronts, the etchings (only a part of the 51 total) of Der Krieg were printed by the Kupferdruckerei O. Felsing in 1924 and are carachterised by a stark realism with an almost hallucinatory taste. The cycle has its model in Goya's Los Desastres de la Guerra (The disasters of war - 1746-1828) and provides both a powerful and unpleasant insight into the horror and paradox of the Great War. Regarded as one of the most important documents on war senseless and human cruelty, Otto Dix's work is yet not a simple condemnation: it testimonies moreover the psychological struggle of the artist self, who first volunteered during the WWI, then kept getting elaborating the trauma of the experienced death for years afterwards. The exhibition enables the visitor to fill the time gap and share the artist's sight on dead, mutilated, decomposing bodies and souls in a lifeless landscape, as if even the nature was killed. Eventually we may be confronted with the unpleasant feeling not being able to wake up from a nightmare - the same feeling Dix probably had in working at this series - and become so aware of the monsters produced by the sleep of reason. Further information on the exhibition (only in German) here.